The cry went up from the back of the bus, somewhere near the border of Burkina Faso and Mali. It was about 1:30 am when some cables overheated and caught fire in the back of the passenger bus carrying a precious cargo, a part of our AHS family. The Danquah family, Elizabeth, Rebecca, Samuel, with Nana and Samuella. Elizabeth Danquah, my very special surgical assistant, her cousin Rebecca and the two Danquah children, Nana, 6, and Samuella, 3, were on that bus, sitting toward the front. 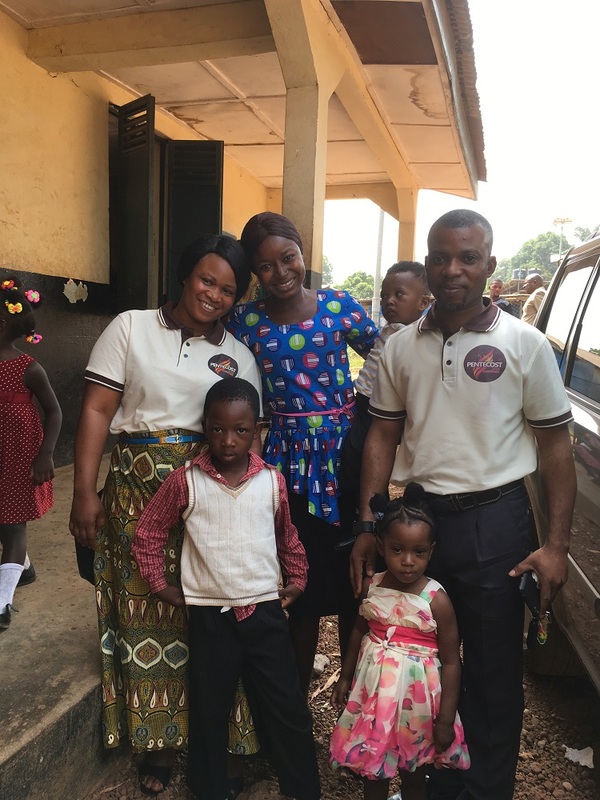 They were traveling back from visiting their families in Ghana for the first time in years. So it was the first time the family had met Nana and Samuella. When the cry of fire went out the children were asleep, the adults mostly asleep. As the bus pulled over to the side of the road people began running forward toward the door, pushing and shoving to be the first out. No one knew when the bus might explode, or become a fireball. In the melee that ensued, little Samuella was trapped, crushed by this river of panic stricken adults. Somehow, by the grace of God, Elizabeth and Rebecca were able to rescue Samuella and get her and Nana to safety. In many ways though, it was out of the frying pan into the fire. All the passengers were now stranded in the bush, in the middle of nowhere, with a broken down bus that is on fire and going nowhere. Soon a policeman showed up and warned them that it was not safe in that place. There were robbers around who would take great delight in relieving the passengers of whatever they might have of value. So he stayed with the group, although I doubt he would have been much protection had they come under attack by a band of thieves. Nana trying to sleep on the ground in the bush. The angels of God surrounded this stranded group of travelers that first night as they huddled together. Morning brought light (safety) and transport to the next city in Mali. And so the little family boarded another transport to continue their journey home, a journey that normally took 5 days, but already was now a day delayed. Later that evening, again in a remote area of Mali the driver of the bus realized he had no brakes. 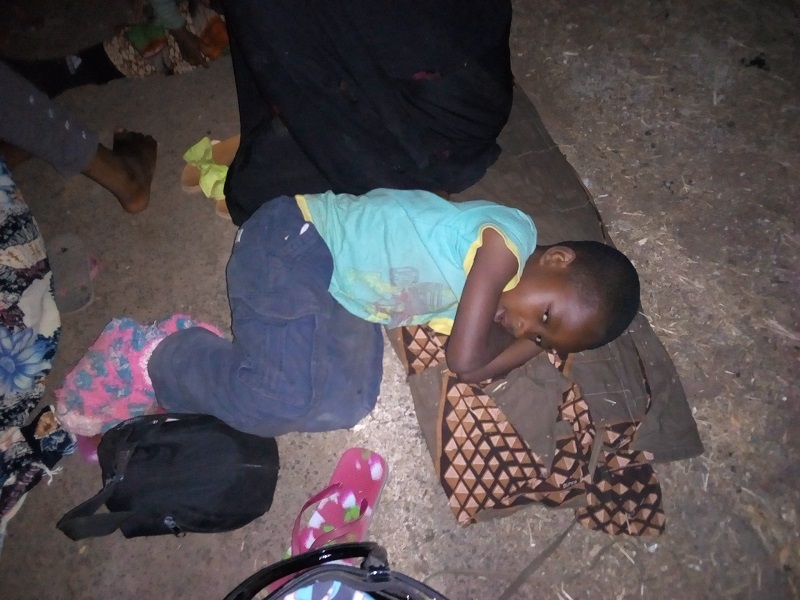 He was able to get the bus slowed and stopped on the side of the road, but another night was spent in the bush with little to no protection from robbers, save the presence of God’s angels. The next day Elizabeth, Rebecca and the children were able to get transport to the nearest city in the country of Guinea. Now only one border was left to cross, between Guinea and Sierra Leone, but it would be a very long day to get to Waterloo. Not to mention all the time that would be spent at the border crossing as each passenger had their documents checked and verified. Then there would be several immigration checkpoints before and after the border. 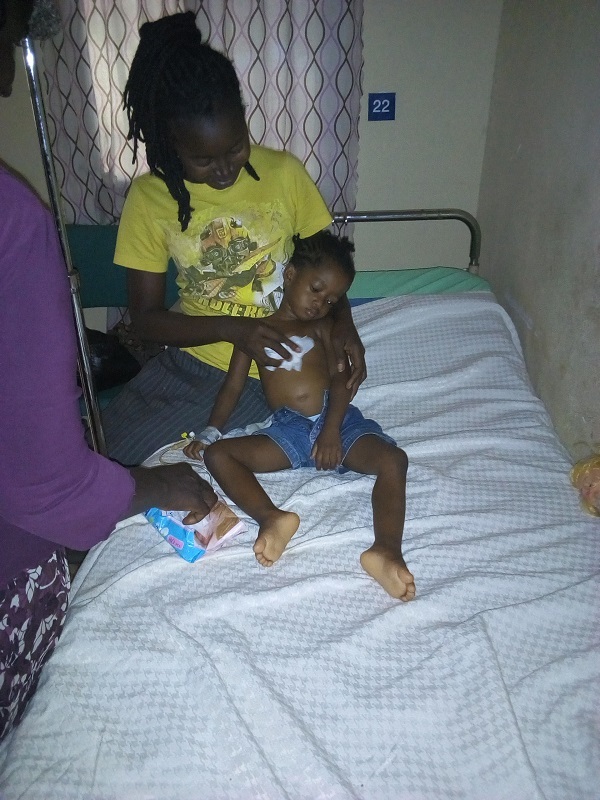 By this time Samuella was obviously ill. She was complaining of abdominal pain, she was throwing up, unable to keep even liquids down. Here at AHS the entire hospital was praying. Our worldwide prayer team was praying. Mr. Samuel Danquah, Elizabeth’s husband and the children’s father, and our Director of Spiritual Ministries, had received a brief message about the fire and that Samuella had been caught in the made scramble to exit the bus. But then for 48 hours, nothing. No word from the family. In this case no news is not good news. No news can mean they were attacked by robbers, maybe they had been kidnapped, maybe Samuella was badly injured. Too many unknowns. But through it all his faith did not waiver, he had left them in God’s care and that was that. In Guinea, Elizabeth knew they were in trouble. Her husband had sent enough money for the trip, but not for extras, like two nights in the bush, a bus fire and bus breakdown. They were down to about 700,000 leones, ($100). Something was seriously wrong with Samuella, she was getting more lethargic, and listless. Still vomiting, and still complaining that her tummy hurt. Although they were getting closer to home, it was still a long way off, with a lot of delays likely to slow things down, and Samuella needed to be seen at the hospital sooner rather than later. As the family walked toward the bus station hoping to find an express bus to take them to Waterloo a man in military fatigues approached them. He had noticed that Samuella did not look good and he offered to help. Would they like him to drive them in his vehicle to their destination? They had never seen this man before. And they are two young women with two little children. Not a good combination. He wanted 1,500,000 leones ($200). They only had 700,000. Elizabeth was able to get her husband on the phone and negotiate with this army man down to the 700,000 le. And so began the final leg of this incredible journey. At the first checkpoint he flipped on his siren and lights and the guards saw the military label on the vehicle and waved them though. At the border between Guinea and Sierra Leone he did the same thing and the guards just waved them through. It was the same at each checkpoint. No stopping, no document checks, no questions. They were able to drive straight through to Waterloo in record time. When they arrived later that same afternoon, Samuella was nearly unconscious. She was severely dehydrated, suffering from malaria, typhoid and anemia, an often lethal combination. Our nurses are experts at getting IV’s in little dehydrated children, and this was no exception. She was started on IV hydration, Ceftriaxone and Quinine. When I went to see her, she barely acknowledged my presence. Samuella and Nana are two of the cutest kids you would ever hope to meet. And they faithfully greet Dr. Scott and Mommy Scott in the mornings and afternoons as we walk by their house. It was hard to look at this beautiful little child of God, knowing that the odds were not good. I comforted myself that at least her lungs were still clear. I went home that night not knowing what would happen, it literally could go either way. I stopped by her room the next morning before worship and was relieved to be greeted by a cry from a cranky little girl. She was better!!! She was going to be alright. That morning in worship there were plenty of praises for God’s grace and healing power. The military man in fatigues? He took off right after dropping the family off at the hospital. Was he their guardian angel masquerading as a man? Perhaps. Was he just a mere mortal military man with a compassionate heart that was tuned into the Spirit of God? Perhaps. Does it matter? Not really. To us at AHS he will always be our angel in fatigues. Elizabeth with a now recovered Samuella. Yesterday at the end of worship the entire staff stood up and held hands, making sure there was an unbroken circle, and we prayed for one of our own. 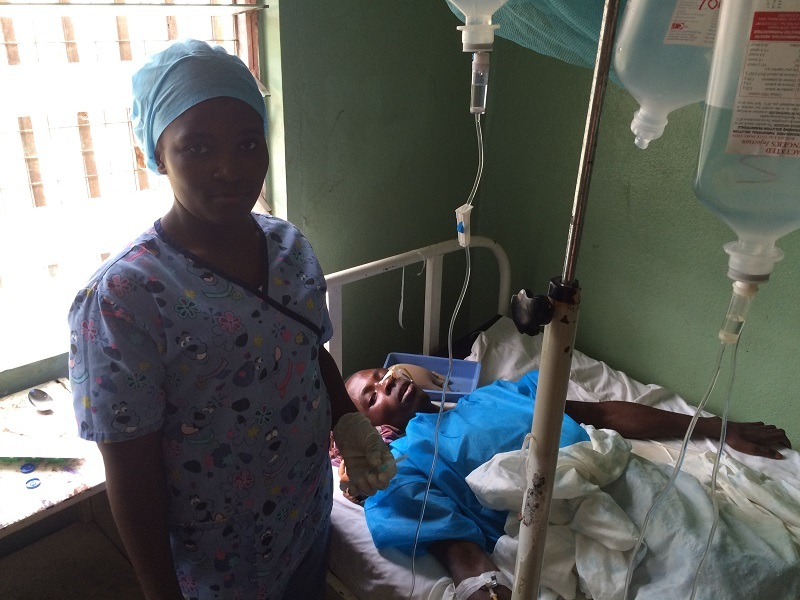 Our lab technician, our Ebola survivor, was ill. He had been ill for a couple of weeks, and wasn’t responding normally to treatment. It could be because he kept going back to work too quickly, and wasn’t getting enough rest, or because he really never let us finish an adequate course of treatment, or maybe he has something else wrong that we can’t diagnose, or maybe it is a result of his Ebola history. 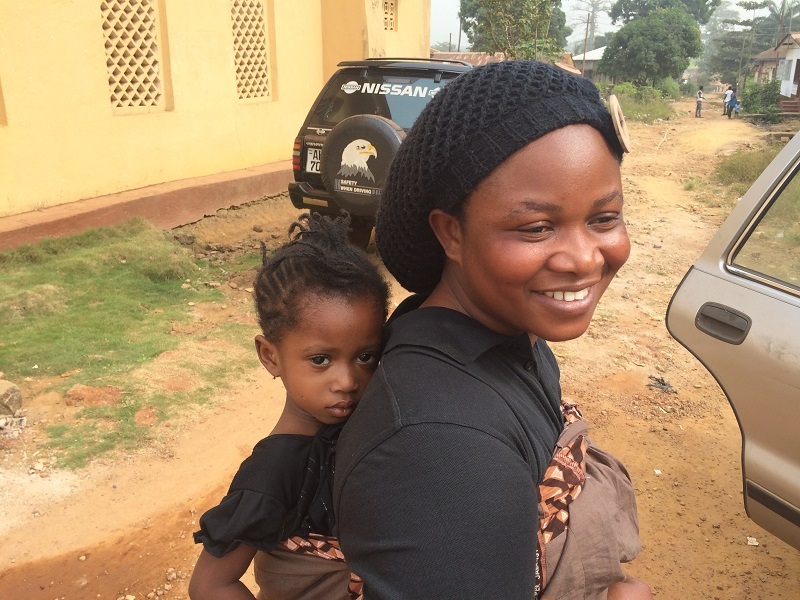 There is some thought that Ebola survivors are relatively immune comprised. Whatever the reason, he just wasn’t getting better. However, that is not why we were praying. We were having this special season of prayer because at 5 am that morning his family had shown up and taken him from the hospital against his will. The staff did not need to be told what this probably meant. When families come and forcibly remove someone from the hospital they typically are planning to revert to the default–take the patient to the natural healer. Every village, every community has at least one natural healer. These are not naturopaths as we understand them. No, these are witch doctors in every sense of the word. I actually had no idea how evil these men and women are until just recently. The AHS family was upset because just three weeks ago we buried the Seventh-day Adventist wife of a prominent staff member whose family had taken over her medical care. The husband shared with me the story. Josephine had been ill for several weeks. The labs tests were all normal, and there was nothing wrong on physical exam, except she didn’t feel “bright”, meaning she was weak and tired. Different medications were tried without much success. Now, it has to be said that this happens in the US as well. Patients have some unknown malady that doesn’t respond to treatment. Eventually they get better, most of the time, or something shows up to steer us in the correct direction. However, in Josephine’s case the family was not going to wait. So, they took her home. Her family is not Christian, although to be honest, it really would not have made much difference. I have observed that whether you are Muslim or Christian, when the going gets tough the vast majority of them will revert to their animist roots. And who do they turn to for medical help? The natural healers. So, these guys were brought in. What I am about to tell you will sound made up,like something out of a horror novel, but it is not, I assure you it is real. First, they found some masses or lesions at various locations on her body. These were removed. Without surgery, without incisions or scars. Cutting, actual cutting with a knife, and blood letting is a very common treatment here. Many of my patients have multiple scars on their bodies as the result of natural treatments. But then they reached into her abdomen and pulled out the real source of the problem, a snake like creature, 8-9 inches long, with a discernable head and tail, that was moving. I have seen the picture of it. It was fortunately destroyed so it would not bother anyone else. I asked if there was a scar. I was concerned these guys had made a hole in her intestine and not closed it and she had died from sepsis. I was informed that these natural healers have magic and the wound just closes over spontaneously and very quickly, leaving no trace of a wound. Josephine seemed to recover some after her “natural” treatments. But then 4 Sabbaths ago her family called the husband saying that she was very ill. She was brought to the hospital and died a few hours later, at the age of 39. Did she die because of the natural treatments or despite them? Did she have some unknown ailment that was to doom her no matter how she was treated? We will never know. But what I can assure you is that as soon as the natural healers became involved with all their magic and potions, God was pushed out. How can God answer the prayers of the church for healing when the devil is involved? Who is going to get the credit if He does work a miracle? It was with those thoughts in mind that we prayed about our lab tech. I am sure most everyone in the room knew the stakes involved. 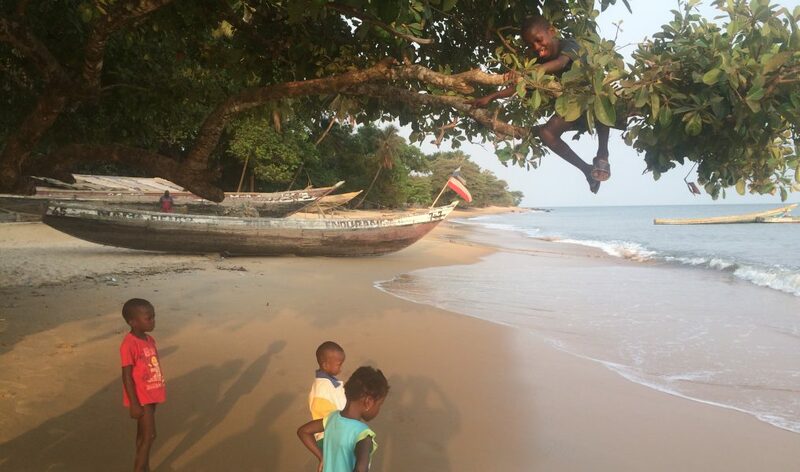 It is extremely unlikely the family took him from the hospital to try to get him into one of the fancy expensive European hospitals in Freetown, or that they are going to airlift him to France for treatment. He knew as well, what was in store for him, which is why he vehemently protested leaving the hospital. But individuals here have no say, it is the family, specifically the ranking member of the family who decides for everyone. So we prayed, we prayed that somehow God would intervene and the family would allow him to come back to the hospital, allow us to continue treating him. We may not have much for diagnostics or treatment options, but we have something greater than that, we have the Great Physician. And in this war, that is worth more than all the soldiers, all the armaments, all the captains and all the kings. Here, the evil, the darkness is so “in your face”, so blatant it is impossible to miss. But it is just as real in the “developed” world. We just call it by other names, or we rationalize it away with our smart scientific theories and ideas, but the evil is there. I don’t know how this will end, but I know God will not force Himself where He is not wanted, so ultimately it is up to us, we choose which side we will be on. And that is a decision we all have to make, whether we live in Sierra Leone, Tchad, France, England, the US, or any other country in this world. I am happy to report that we just received a message from our faithful lab tech wishing us a Happy Sabbath, and telling us that he is home and will not let anyone mislead him. Praise God, but, he will need all the power of heaven to stand against the will of his family. Is A Human Life Worth $200? I happened to glance out my office window yesterday to the front parking lot of the hospital. I watched bemusedly as a yellow cab pulled in, the front seat passenger got out and opened the right rear passenger door. My curiosity was piqued as I watched him pull out a young man by his arms. As if out of nowhere a crowd appeared and several pitched in to help carry the patient up the steps into the hospital. It didn’t look good, but it also didn’t look surgical, I hoped. We had just cancelled my one case for the day because the young lady had eaten breakfast so I was looking forward to being able to get caught up on paperwork and other administrative stuff. Not long after I ventured out of my office and ran into Mr. James Abu, our CHO (Community Health Officer, basically a nurse practitioner). “OK, no problem.” This is my usual response whether it is a problem or not, always hoping the lilt in my voice would put a smile on my otherwise sour face (those of you who know me will understand). I asked if this was the young man they had just brought in. Sure enough it was. So much for being nonsurgical. 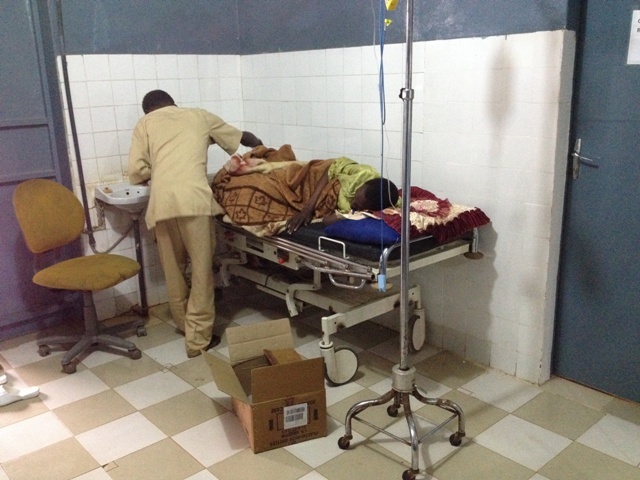 We went to the mens ward and found a young man, Sahr, in his early twenties laying on his side facing the wall. He had little ulcers on his right leg. I found out he had fallen from a mango tree some years back and has been paralyzed since. The history was three days of abdominal pain, nausea and vomiting. Indeed, he looked like a bowel obstruction, distended abdomen, tight, tympanic (sounded like a drum when I tapped), no evidence of an incarcerated hernia and no peritonitis. Here, our only non-invasive diagnostic is an ultrasound done by a rank amateur (me), so the only real decision is does this patient need an operation and if so, when? Well, he needed an operation, and since the crew was there and anesthesia was present, now was good. I am done with not treating someone with a life threatening or emergency condition simply because they cannot pay. We will get what payment we can from them later. But as a hospital it is our creed to treat everyone regardless of ability to pay. God will either make up the difference, which so far He has, or we will go under. But I am going home if I have to turn someone out because they don’t have money. Back to the story. In the OR, I was explaining the necessity of being careful when opening the abdomen on cases like this to the surgical team. Because the abdominal wall is stretched thin and the dilated bowel will be just underneath it is easy to slice into the intestine. (Most teaching of this nature is from personal experience, this was no different). This time though, as I gently opened the peritoneum there was a rush of odorless air. It was followed by thick yellow fluid, 5 liters of it. The surgery people among you know exactly where I am going with this. No bowel obstruction, but instead a 1 centimeter (1/2 inch) hole in the duodenum, just below the stomach. Diagnosis, perforated ulcer. As I repaired the hole and cleaned him up, I marveled at how far God had brought us in such a short time. A month ago I would never have dreamed we would be ready to do a case like this, but with our new suction and cautery and OR Table and the reorganization of the OR, we were ready. The case went well, and I am happy to say that today he looked as good as anyone can look with an NG tube hanging out their nose. He has a long way to go, and many bad things can happen, but so far a life has been saved by God’s grace. Sahr the morning after surgery. After surgery I met with the family and explained what we found and what we had done. I also shared with them that Sahr was still very ill and needed lots of prayer, and that God is the One that would need to heal him. In worship this morning Mr. Abu shared the “rest of the story”. In the days since he became ill the family had taken him to traditional healers and other clinics and hospitals. Sahr had been treated with herbs and other local remedies, which I can attest to as I suctioned out a number of pieces of leaves from his abdomen. The family had spent all its money before coming to AHS. They had only enough to pay the 30,000 leones ($5) for the consultation. If we had insisted on some payment yesterday before treatment they likely would have put him back in the taxi and driven off, and he would be dead today, instead of being on the mend. And we would never have had the opportunity to point them to Jesus as the Source of healing. Will Sahr fully recover? Remains to be seen. Will the family pay? Probably something, although not likely the entire amount. Will it hurt us financially? Maybe. Is a human life worth $200? Definitely. For those of you who are new to our blog please look around at the other pages, the “About” page tells a bit of who we are and our background, the “Definitions” page explains some terms that are used that some of you may not be familiar with, such as GC or AHI. The “Timeline” gives an idea of where we will be throughout the year. 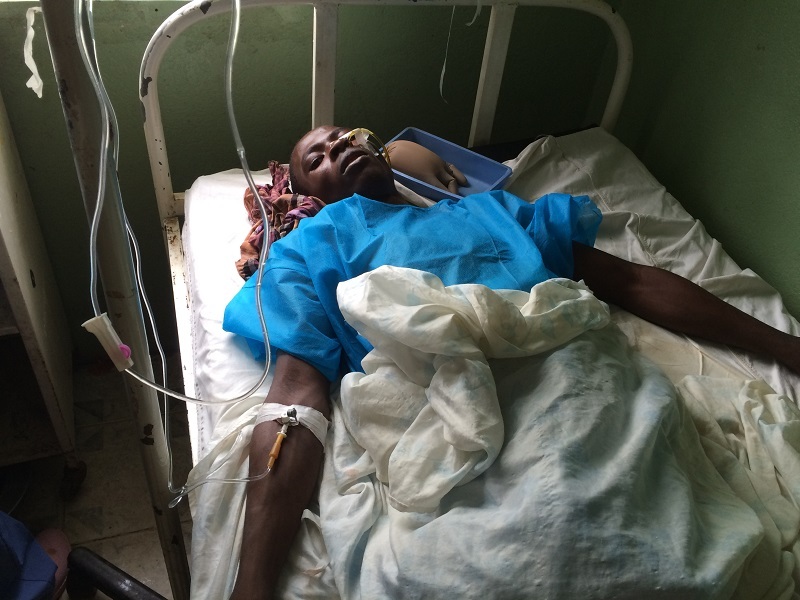 On the “Videos” page watch a real Ebola survivor, Dalton Kabia, tell his story. Watch our community health officer explain why the staff agreed to work in the Ebola Red Zone even after they lost 2 staff members to Ebola. There is also the Surgical Pictures Page, but be forewarned, it has some very graphic pictures, so if you don’t like blood and guts, stay away from that page. On the Projects and Donations pages you can find the projects we are working on and how to donate to the project that touches your heart. Finally, if you like our blog and want to receive each new post directly to your e-mail, please sign up with your e-mail in the subscribe box. It doesn’t cost anything, there is no commitment, it just makes it easier to follow us.